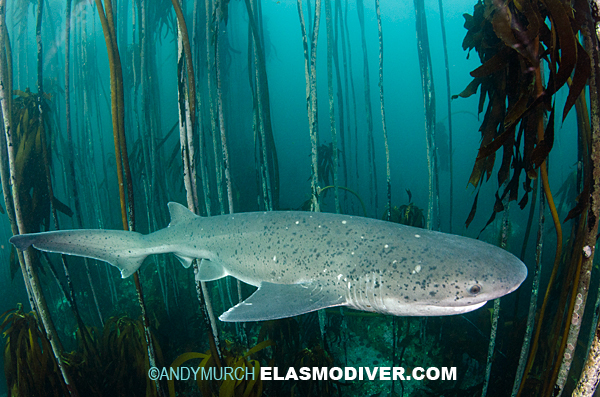 Common Names: Broadnose Sevengill Shark, Spotted Sevengill Shark, Spotted Cow Shark. Identification: Bluntly rounded snout. Seven gill slits, posterior slits very short. Single dorsal fin set well back on body. Upper body sprinkled with small black spots and usually some white spots. Large size. Size: At birth 34-45cm. Males mature at 130-170cm. Females mature at 200cm. Maximum recorded size 290cm. May possibly grow to 400cm. Habitat: Coastal sandy bays and rocky shorelines up to the surf line. Larger individuals inhabit deeper channels. Recorded at 136m but usually found in 1-50m. Abundance and distribution: Temperate coastal waters around the world. Southern Australia, New Zealand, Japan, Southern Africa, east and west coasts of south South America, and west coast of North America to Alaska. Behavior and Diet: Cruises steadily along bays in search of food moving in and out with the tides. Prefers low visibility - night, turbid water, overcast conditions. Known to aggregate possibly for mating. Footage from the documentary Shark Quest shows a group of Broadnose Sevengill Sharks feeding together on a stingray carcass. Preys on sharks and rays, bony fishes and marine mammals. Reproduction: Ovoviviparous (aplacental viviparous). Litter size 67-104. but may be higher. Gestation probably around one year followed by one year of recovery. Observations: Broadnose Sevengill Sharks have been observed spy hopping - holding their heads above water and seeming to look around. This behavior is rare among sharks but has been regularly observed in Great White Sharks. It may be an adaptation to aid in the capture of marine mammals. Conservation Status: The IUCN lists this shark as 'Data Deficient'. However the IUCN notes that the broadnose sevengill's flesh is sought after in some markets. It is also taken in some areas for its hide and liver oil. Intensive commercial and sports fisheries in San Francisco Bay targeting it for its fine meat caused a marked local decline in numbers during the early 1980s. It is utilised in China for its skin and liver. Pollution may be a possible threat to inshore bays which are sevengill nurseries. 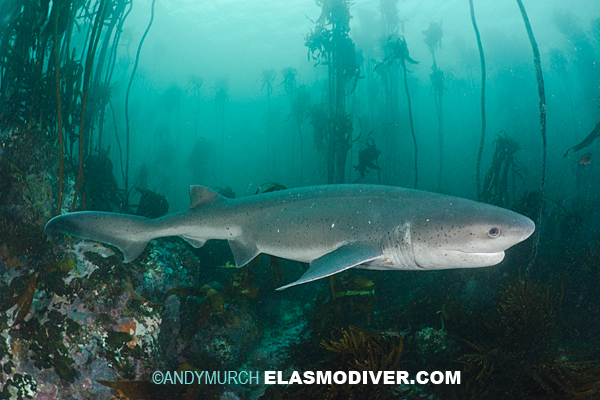 Although wide ranging in temperate waters and moderately common where not heavily exploited (e.g., southern Africa), this large shark has a limited inshore bathymetric range in heavily fished temperate waters and is often concentrated in shallow bays. This exposes it to intensive inshore bycatch and sometimes targeted commercial, sports and semi-commercial fisheries over most of its range, particularly off China, California, Argentina, Namibia and South Africa (Compagno in prep. a). Catch statistics are not reported, except for the west coast of the USA, which show a peak in landings of 1.55 t in 1981 with a sharp decline to less than 0.1 t in 1986 (Compagno in prep. a). Similar species: The Bluntnose Sixgill Shark (Hexanchus griseus) has a very similar body shape but lacks the seventh gill slit and has less or no spots. The Sharpnose Sevengill Shark (Heptranchias perlo) has much larger eyes, a more pointed snout, and flattened, elongated pelvic fins. Reaction to divers: The Broadnose Sevengill sharks tend to ignore divers but they will turn and swim away when intercepted. Sevengills can become aggressive in baited situations e.g. towards spear-fishermen. In captivity it has bitten aquarium divers. Diving logistics: Although this shark has a broad distribution it is not commonly encountered by divers in most areas. However, Miller's Point off of Simon's Town near Cape Town, South Africa offers extremely reliable sightings. Sevengill shark sightings along the coast of Southern California are also increasing. La Jolla Cove is a particularly good site where multiple sharks can sometimes be seen on a dive. Divers sometimes carry bait in this area to encourage encounters.